There are many factors at play when it comes to a beautiful smile. Our smile reflects who we are, who we want to be, how we feel about the world around us and how we feel about ourselves. Having a beautiful smile doesn’t necessarily mean your teeth are a Hollywood idea of perfect. Having a beautiful smile means showing the world who you are, that you care for yourself, respect yourself, love yourself, and that you are confident and happy to share that with the world. And it starts with good oral hygiene. By maintaining a healthy lifestyle, you can prevent common dental issues from developing and ensure your teeth’s long-term beauty. If you keep up with healthy dental habits on a daily basis, you’ll have even more to smile about. To really make sure we are taking the very best care of ourselves means taking care of our teeth and mouth. Here are some of the ways you can make sure you are giving your teeth and mouth the best chance of a beautifully healthy smile. Limit snacks between meals – especially sugary or heavily processed ones! We recommend brushing two to three times daily – morning, night, and after any high-sugar meals. Remember at school when the dental nurse would come in to talk about how to brush effectively? Take your toothbrush and work your way around your teeth, both back, and front, in tight circles. Small circles mean your gums aren’t being damaged by excessive back and forth sawing actions that can lead to gum deterioration. Brush for two minutes with a dentist-approved toothbrush and toothpaste and before you know it, you’ll have a bright, clean smile. It’s important to replace your brush every three months to ensure effectiveness—weak bristles don’t get the job done. No toothbrush, no matter how technically advanced, can clean those in-between spaces where gums and teeth meet. Flossing once a day removes plaque and any undesirable remnants of food from hard-to-reach places. Plaque, the bad guy of the oral world, hardens and becomes tartar – the boss of the bad guy – which can only be defeated with a professional cleaning. A build-up of tartar can produce cavities, gum disease, bone loss, and might even lead to lost teeth. Using a dentist-approved dental floss and mouthwash daily, preferably before bed, really helps keep plaque in check, and stops tartar from becoming a serious problem. Snacking between meals is not only detrimental to the waistline, it can also be a real problem for your teeth and mouth. Because oral hygiene is a crucial part of overall wellness, limiting sugary, high-starch, high-acid snacks and foods will help maintain a healthy and beautiful smile, as well as a healthy and beautiful you. If the hunger monster strikes mid-morning or afternoon, go for some tasty, seasonal fresh fruits or vegetables, and nuts. These help stimulate natural saliva flow, reducing tooth decay and re-mineralizing the surfaces of your teeth. And if you do have a particularly sweet treat to get over that 3 pm lull, take a toothbrush to work or school and give your teeth a treat straight after! Your smile will thank you for it. Did you know that smokers are four times more likely to develop gum disease than non-smokers? Smoking cigarettes, cigars, or pipes—or chewing tobacco—increases the risk of oral cancer. Also, most smokeless tobacco brands use sugar-based sweeteners, which makes users more susceptible to tooth decay. We recommend avoiding all types of tobacco, even e-cigarettes that use real tobacco, to protect your teeth and gums – as well as your lungs – for life. Keep up with your regular check-ups and cleanings! Even if you are totally dedicated and follow the above habits to the letter, it’s still impossible to remove and keep all plaque from your teeth and gum line. Plaque begins to build up every time you eat or drink. 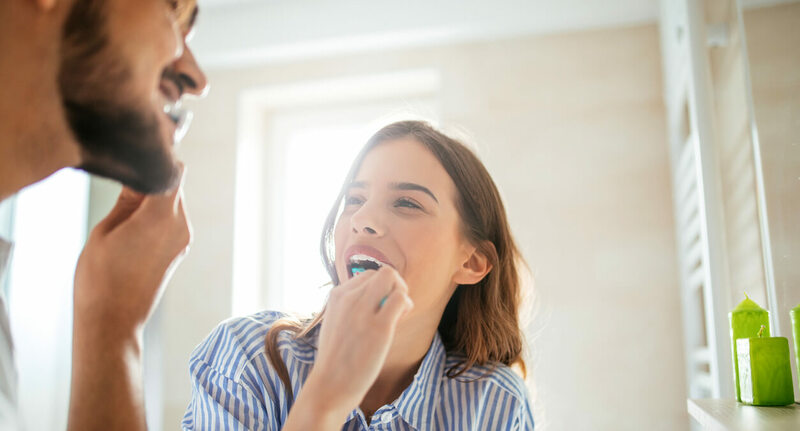 To make sure you stay on top of plaque build-up and any tartar pockets that have escaped your brushing, flossing, and good habits, we recommend regular teeth cleanings and check-ups at Fraser Dental at least twice a year. We want to ensure your smile stays confident and radiant, and that your teeth and mouth are healthy, happy, and beautiful your whole life. To book in for a dental check-up or teeth cleaning, contact us and we’ll make sure your smile is in the best possible health it can be.